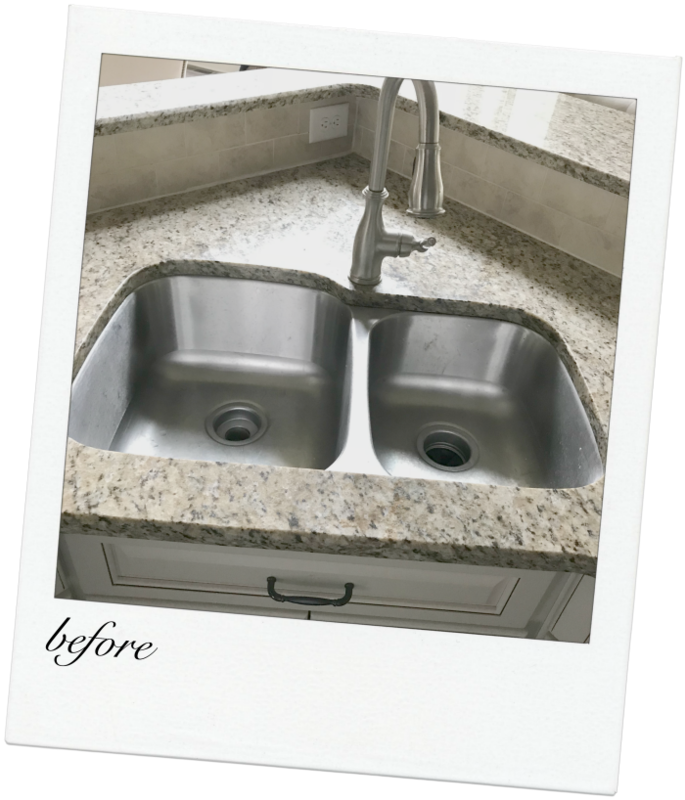 A few months ago, I didn’t realize a few cracks in our granite kitchen countertops would end up turning into a full kitchen makeover project. Within a week, I went from ignoring and praying them away to deciding maybe their happenstance had initiated the opportunity I needed to update our too-traditional, dark (and let’s be honest – a little dated) cream kitchen. Because it was a little bit of a surprise and it wasn’t on our immediate to-do list, I knew we wouldn’t be gutting the thing (nor did we need to). In fact, after coming up with a full wish-list of potential projects, it became super clear that I was going to need to get creative and prioritize. 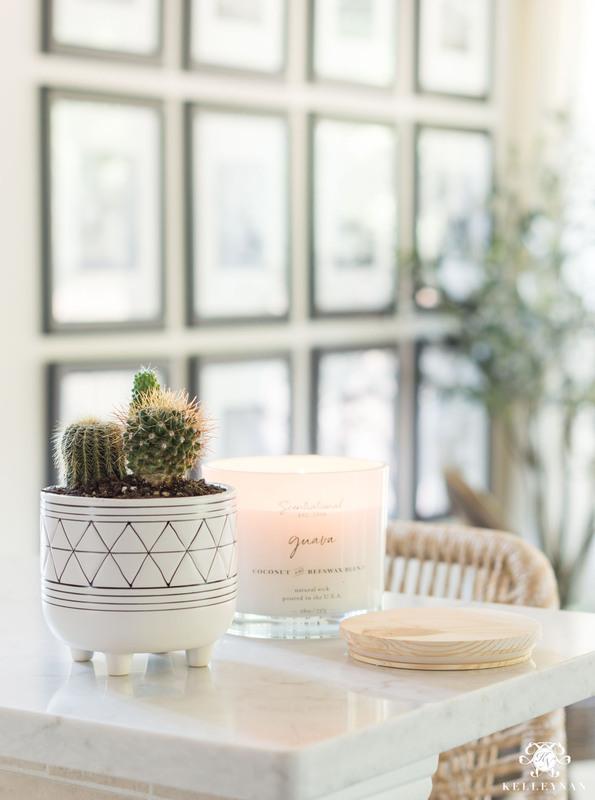 The overall goal – to brighten up my windowless cream kitchen and make it a little more modern. 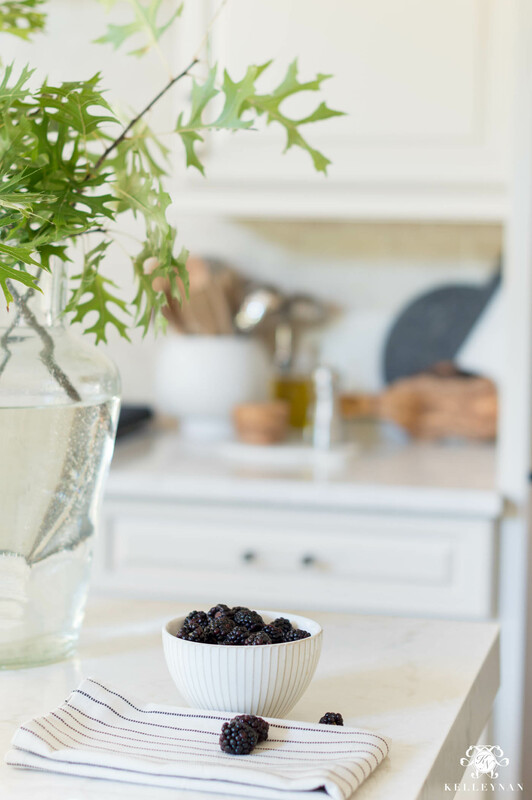 Let me tell you – trying to brighten a kitchen when you aren’t starting from scratch isn’t an easy feat. Most colors that compliment creams are in the brown family… which is what I was trying to move away from. 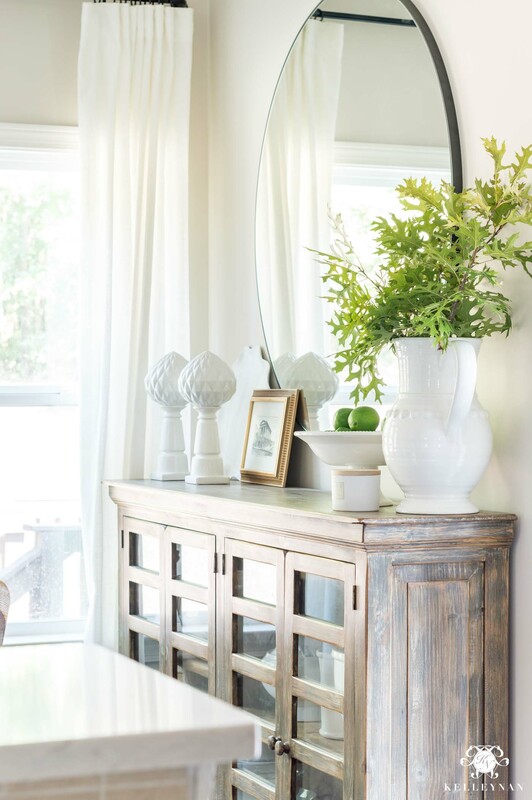 Picking complementary materials and paint aren’t as simple as choosing something “white” out of a lineup. 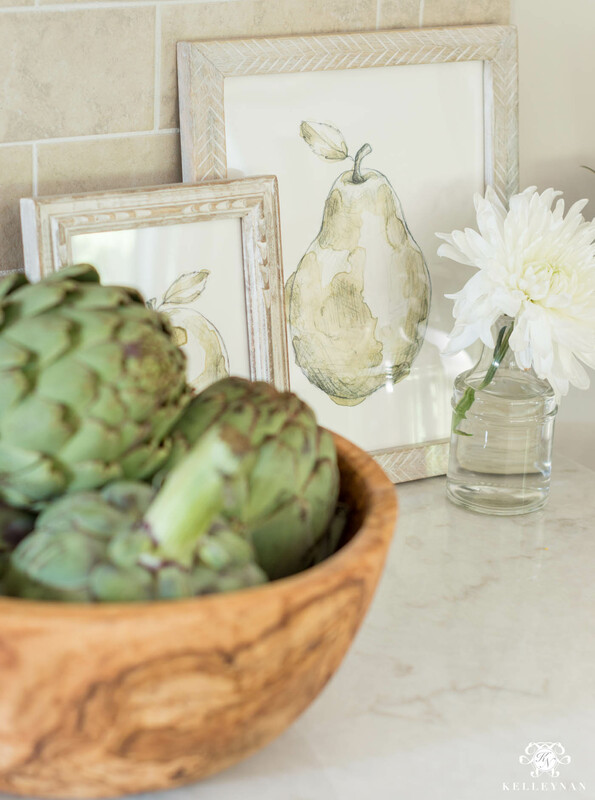 I quickly learned that without the right tones, undertones, shades, etc., my cabinets and backsplash could easily yellow or contrast against their new surroundings too much, emphasizing that they were out of place. Well, fast forward a few months and I have an updated, more modern (but still cream) kitchen that I love. 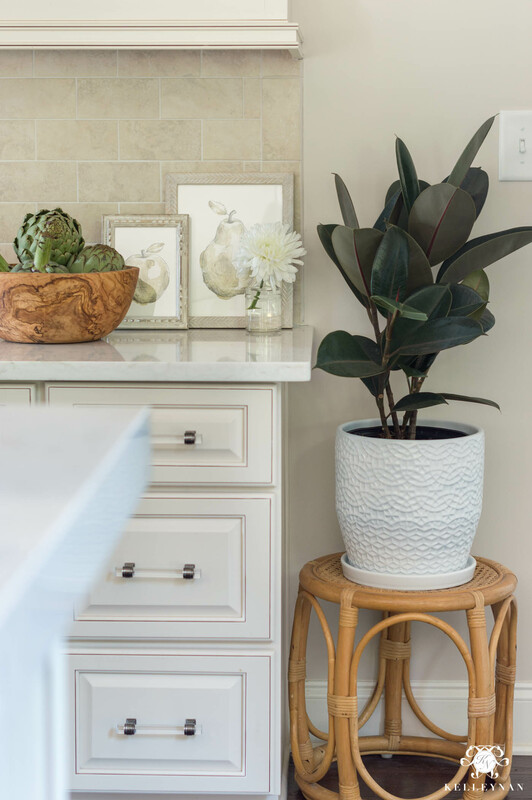 If you’re working to update your space and have a few work-arounds (like cream cabinets), it can be done. Before we head in, I wanted to share that one of the most notable updates wasn’t even in the actual kitchen. We have a two-story great room (which I love) but there’s a huge, bare wall that’s always looked… well… kind of awkward. Remember that molding project to frame the kitchen from my progress post HERE? Well, here’s the result. The difference of this view is huge; it brightens things up before even moving past that wall and gave a much-needed-break to that boring, wasteland of a wall. It’s an easier update than you make think, too. My carpenter used strips of molding to create the picture frames (like our master bedroom) and built a column to match the columns on the opposite side of the room. Painted with glossy paint, matching my trim, and it all looks like one piece. Plus, no more scuffs under the bar! You guys… seeing the transformation laid out (along with my slightly improved photography skills haha) makes me want to cry. 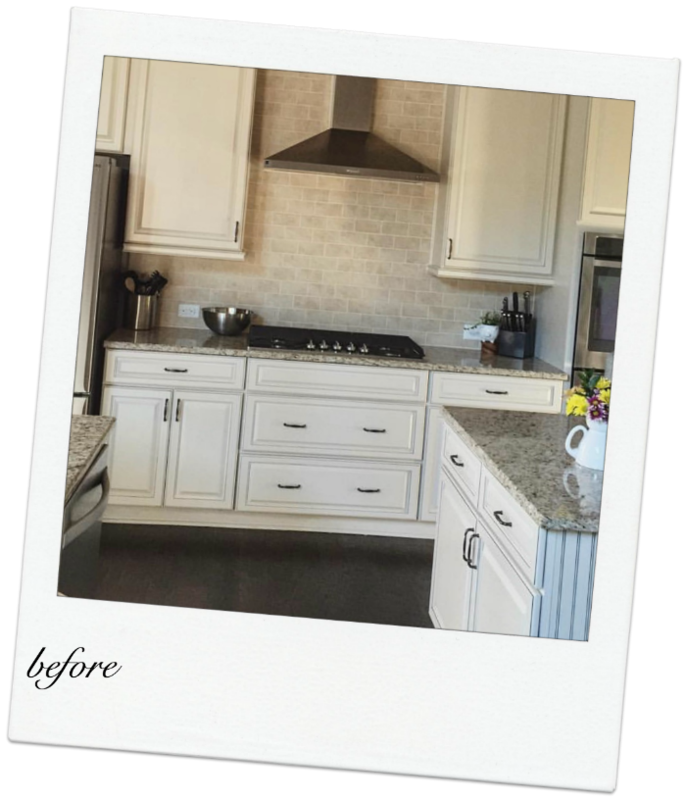 If you were thinking “how different can it really look without changing cabinets and backsplash?”, this is how different. Here’s how I did it. The countertops were the first major decision. I mean, they were the entire reason we were taking on the project in the first place. 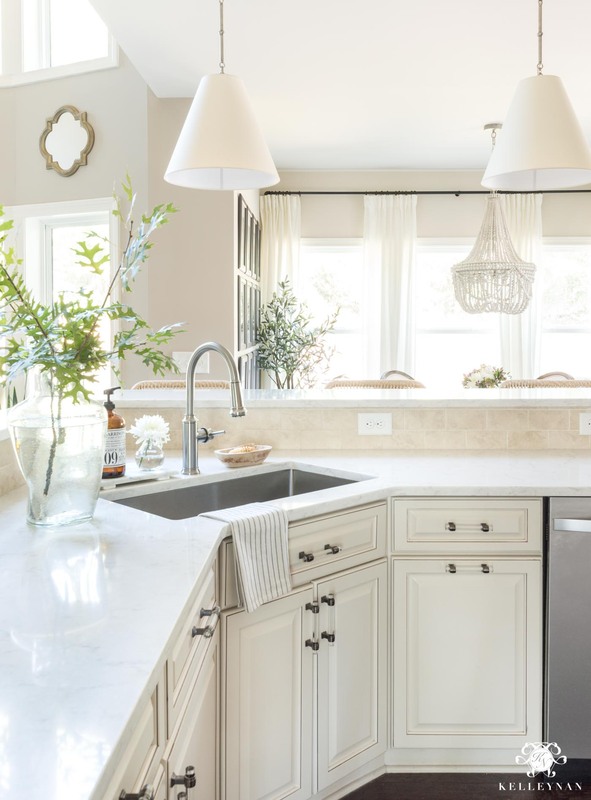 I went into extensive detail on making selections in my initial plan post HERE, but I really can’t stress how important (and challenging) it was to select the right white quartz. 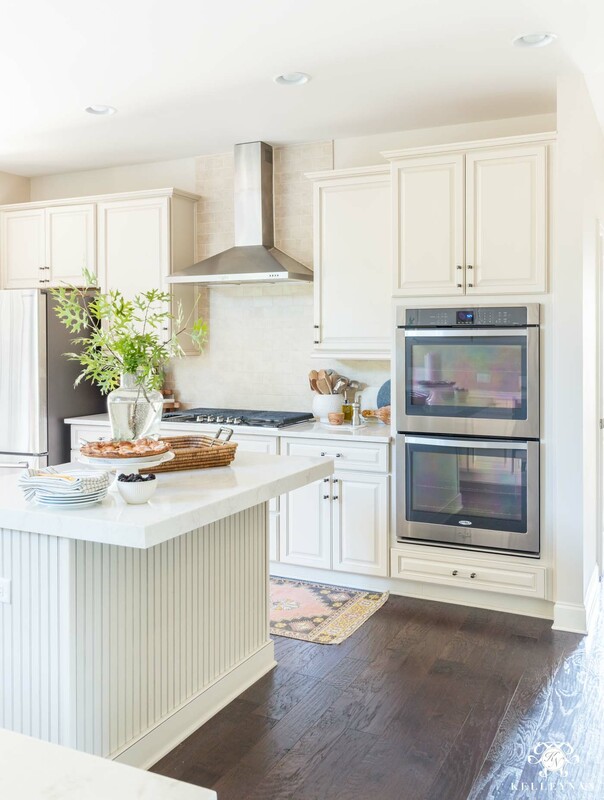 I had to find something that would marry the traditional elements of the kitchen that were staying, with the new, modern touches I was bringing in. Something stark white or more contemporary with a large, drastic veining wouldn’t have blended. 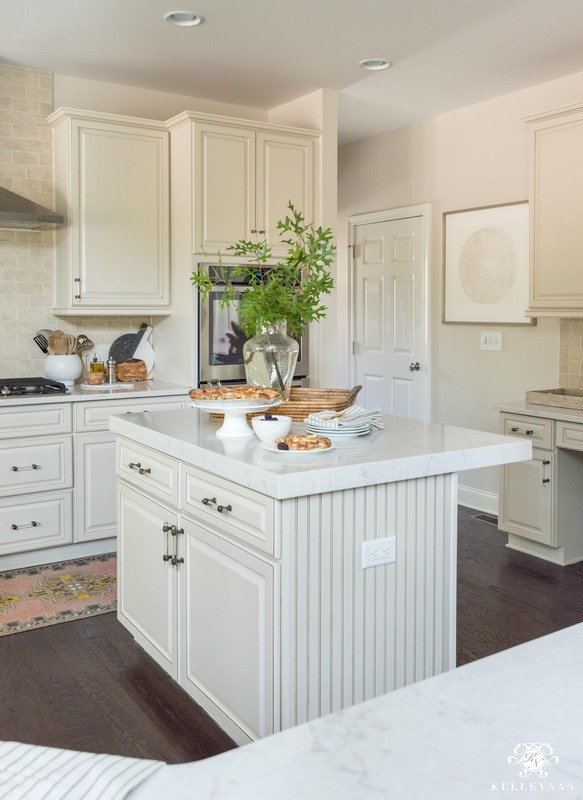 I wanted something that could lend itself to multiple styles, and something that could compliment both cream and white cabinetry. I also needed to veer away from some of the marble-looking quartz finishes that had more blue-gray tones. The LG Viatera Soprano quartz I found has more subtle movement and marbling, has a more creamy base, and has both gray and gold marbling. 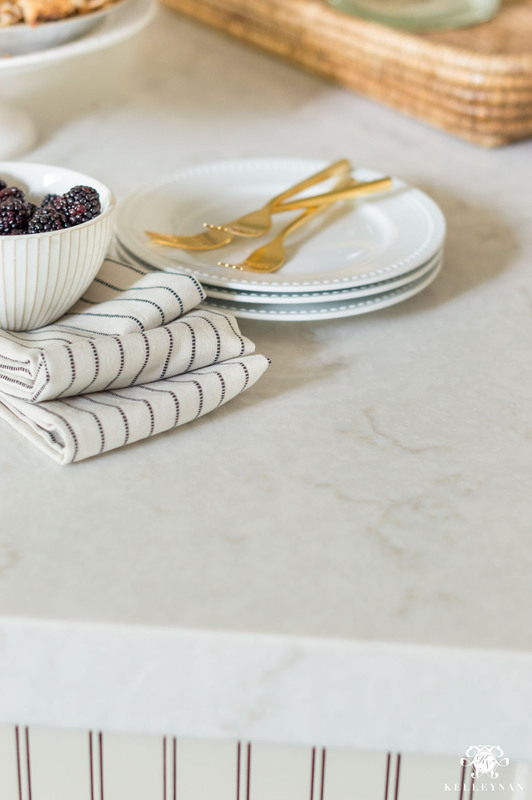 *Make sure to pick up samples; depending on cabinets, paint and surroundings, the quartz can take on a different shade. Do not depend on website samples. 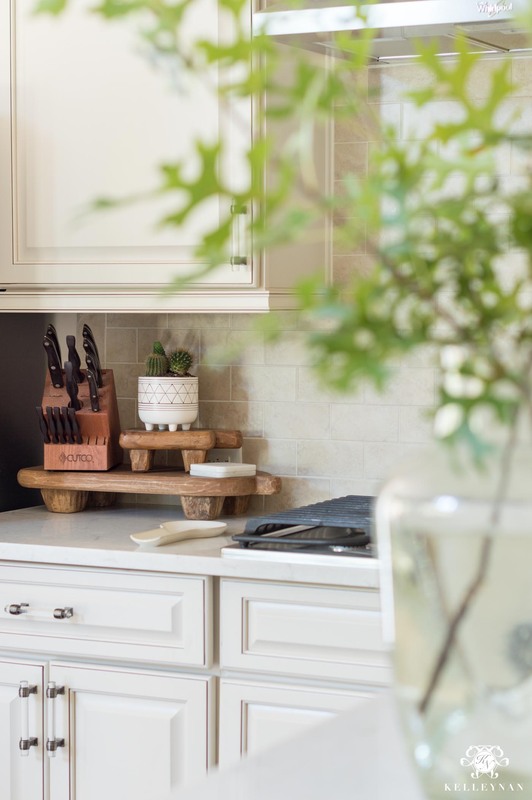 Since I initially shared my challenges, what I was doing, and the countertops I was going for, I have had readers come out of the woodwork, sending emails that they are in the exact same spot – cream cabinets and dark granite. 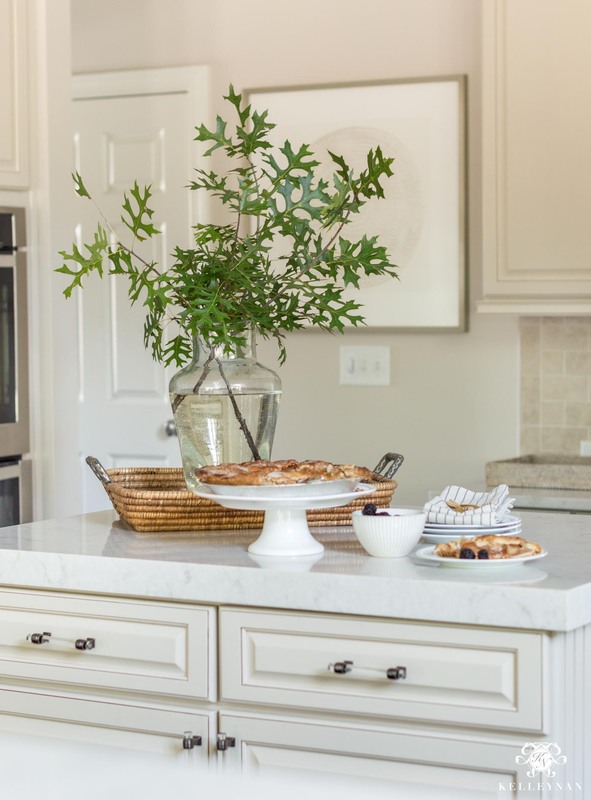 I think updated countertops can be overlooked in the prioritizing and budgeting stage because they aren’t flat against the wall and people may discount their potential impact. Well, I’ve lived with mine for a couple months now and the difference in brightness is crazy with the surface reflecting light to such a higher degree. And this is what it looks like with the Soprano quartz countertops. As opposed to the potential drawn-out process of painting/replacing cabinets, the countertops only took one day to install. Literally. I share more about that process in the progress post HERE. After Atlanta Stone Creations came out to measure, they were able to demo and install in the same day. There was also zero mess (this isn’t the kind of kitchen project that puts you behind tarps, covered in dust for weeks). Just because I wasn’t changing the cabinets didn’t mean I couldn’t change the cabinet hardware. Because I committed to not changing/painting the cabinets, I stuck with uniform pulls, in the same spread as my former pulls, across the kitchen. After researching and sampling several pulls, I quickly figured out I was drawn to the way two-toned hardware looked against my cabinets. Even those THESE are clear (I went with the gunmetal finish), they are so much more substantial and sleek than the more dainty ones I switched out. Plus, the finish kind of accentuates the glazing, but in a subtle (almost pinstripe way). I even upgraded our paper towel holder to coordinate (y’all would laugh if I showed you what we were working with before haha). I really struggled before in using some of my wooden and woven accessories, baskets, etc. in the kitchen because it made it feel even more dark and weighted down. Now, with the new light backdrop, I can actually bring in some of my favorites. And here is what may be my favorite view today. Another huge improvement that I almost didn’t take on – switching the sink. We had a double-basin undermount before and in theory, two compartments sounded better than one. That is, before I had to use it and couldn’t actually fit more than one pot in at a time, lay pans flat, etc. I was interested in the idea of one big basin but it was actually the curved cut-out that I decided was “dated” that made my decision. Trying to bring in edges and elements that were more streamlined, straight, and sleek were huge in updating the overall look of the kitchen. Because the countertops would have to be cut anyway to the specs of the sink, there was literally no better time. It was now or never. 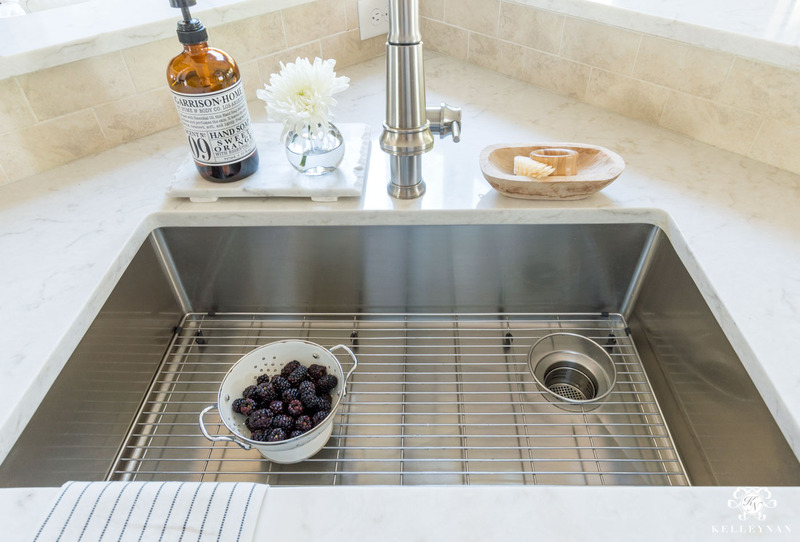 And this is why changing the sink would be one of my top three, non-negotiable changes if you are looking to bring a little more sleekness (and function) to your kitchen. Blanco recently came out with a single basin with side drain; I have so much room (33″) and zero reservations about ditching the two-compartment basin I had previously. I also had no idea how much I would love having the grate on the bottom – not just for washing pans without having them sit in their own dirty-water-run-off, but for colanders, too. I liked the design concept of my previous faucet (pull-down sprayer, goose-neck) but was happy to find one that was a little more streamlined, especially since the sink is basically the center point of the kitchen/living room area. There’s no hiding! There’s a lot of power behind that nozzle. We’ve talked about the paint dilemma. Extensively. 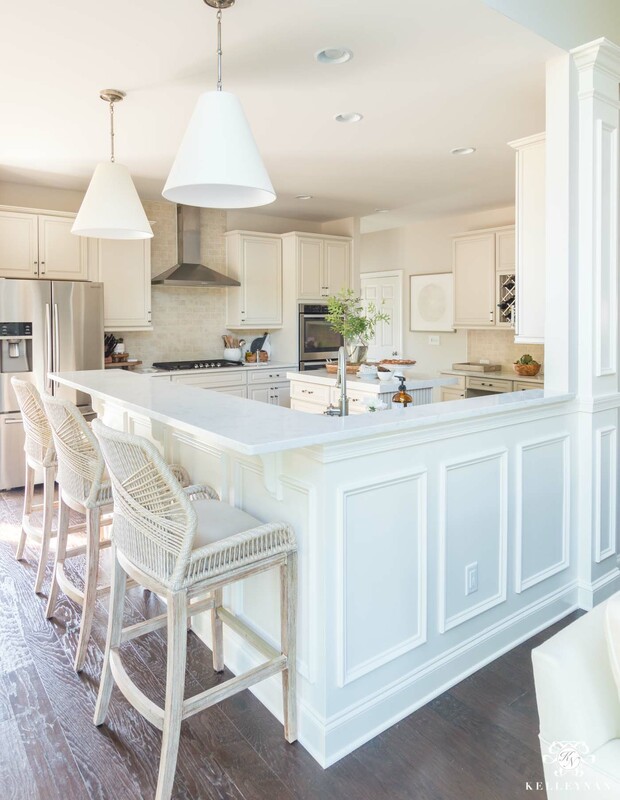 No matter which direction I considered, it seemed like a double edge sword – too dark of a paint would lighten the cabinets and make the space look too dark. Too light of paint would brighten the space, but the contrast between the walls and cabinets would make the cabinets look like short, yellow boxes. 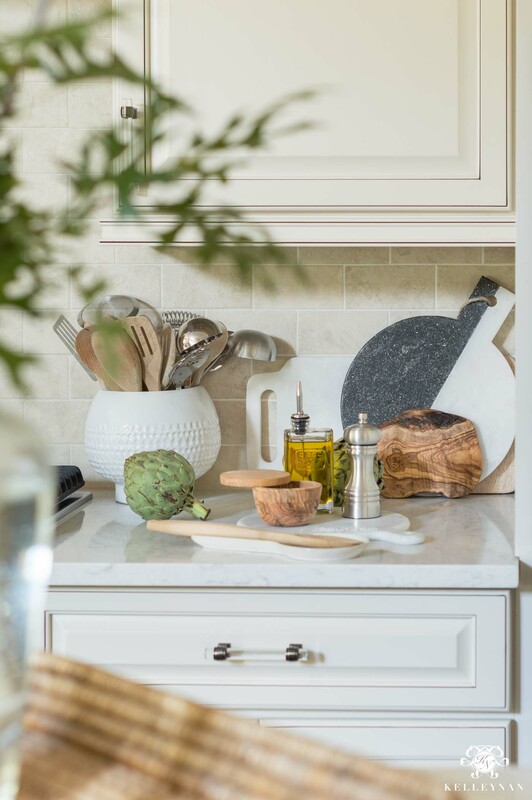 When I painted the samples of Edgecomb Gray on my walls, it looked WHITE compared to my former paint color (which made me nervous), but after following through, it came across as a pale warm greige that almost matches the tone of the cabinets. Mission accomplished. Remember this heavy look? For the first time in this house, I actually painted the ceiling a little differently than the walls. I took the recommendation of the paint store owner and cut the ceiling by 50%; it definitely lightened up my shadowy spaces- hallelujah! 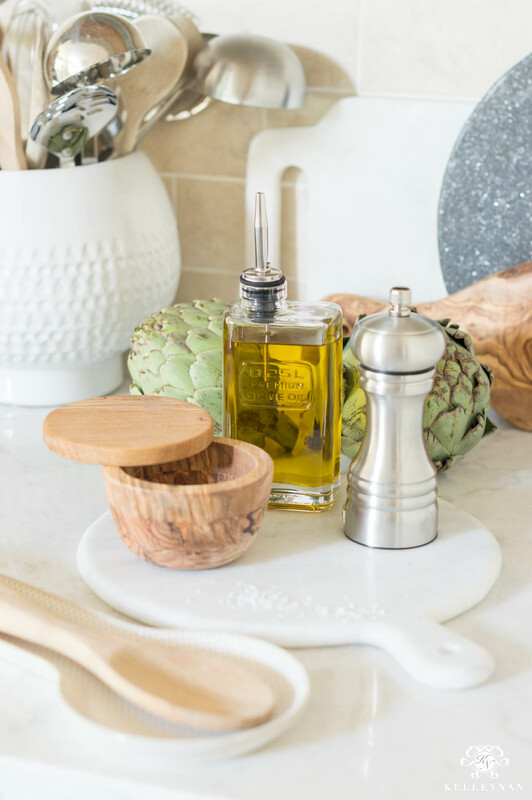 Like I mentioned before, with my old, dark, speckled countertops, I felt I had to steer clear of any warm woods, dark materials – even things like yellow olive oil – to try to balance some of that darkness away. Now, I can put my eclectic mix to use and put my collections on display. Mixed finishes and organic materials are totally in; I bet you have more pieces hiding in your cabinets than you realize. I’m crazy over the planter I ended up using as my utensil crock. I scored it at At Home recently, not knowing exactly where it would go, and threw my utensils in there to corral them while I was waiting on the actual utensil crock I ordered to arrive. It ended up being a classic Bob Ross “happy little accident” because once the actual marble crock I’d ordered arrived, I decided to stick with my planter. 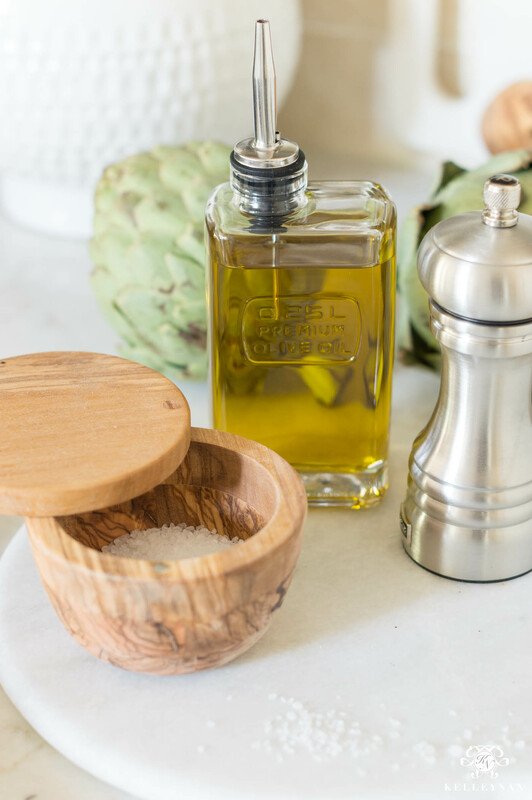 This little salt cellar my mom gave me a few years ago is what started my love affair with olive wood. The lighter space let me share more eclectic finishes in general – white washed woods, warm wood, cane, mixed metals, white ceramic, etc. Remember that pretty olive wood bowl (one of the first things I purchased)? These sweet little art prints were among the first items I selected a few months ago, too (one in a 5×7; one in an 8×10). During my last trip to visit my mom, I snagged this cane stool she had out of sight on her upstairs landing, and last week, I picked up a turquoise planter and took a few minutes to coat it with fresh, white, satin spray paint. The original art I had selected a few months ago for the back wall was totally wrong; it was relocated to the sitting room and I instead brought in THIS fresh piece. It’s subtle but just what I needed in that awkward space between the garage door and stationery desk cabinets. I used to have bulky faux wood white blinds on this door. They were constantly in the way, the cord was a wreck, and they would never stay anchored. 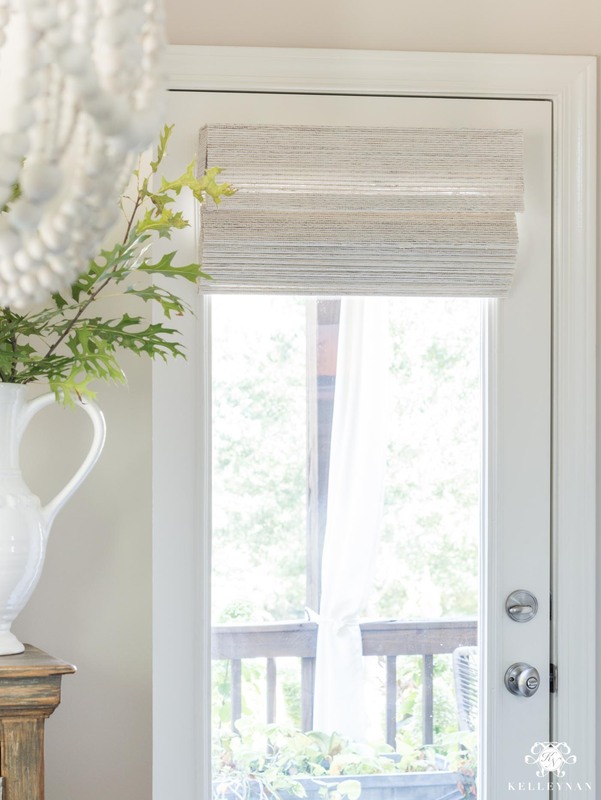 I’ve been dying to outfit this door in the same cordless, woven shades as our upstairs bedroom deck door and along with a quick fresh coat of door paint, WOW. 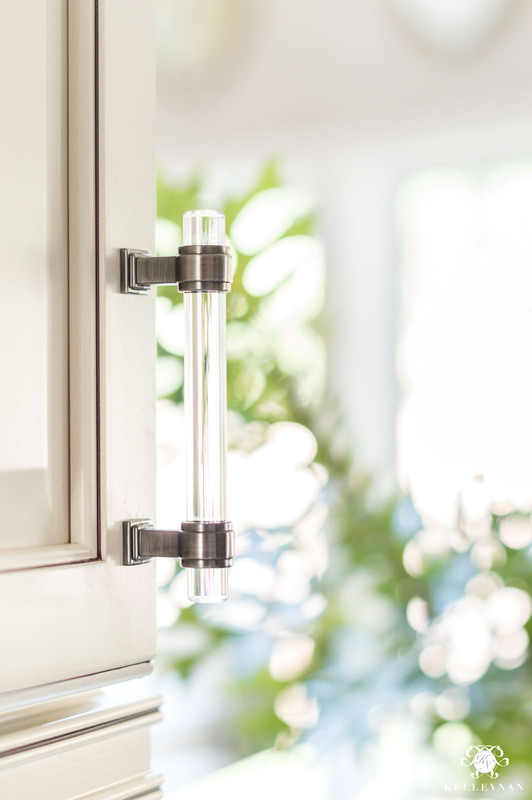 Yes, the look is an improvement x 1 million, but it functions SO MUCH BETTER without having blinds sway and thrust back and forth every time the door shuts. You guys know the story on the barstools; I love them and yes, am still using that one on the far right as a daily office chair haha. It’s worked out to be the perfect, prime spot to consider living room/kitchen projects/orders as I’ve been working on the two spaces. 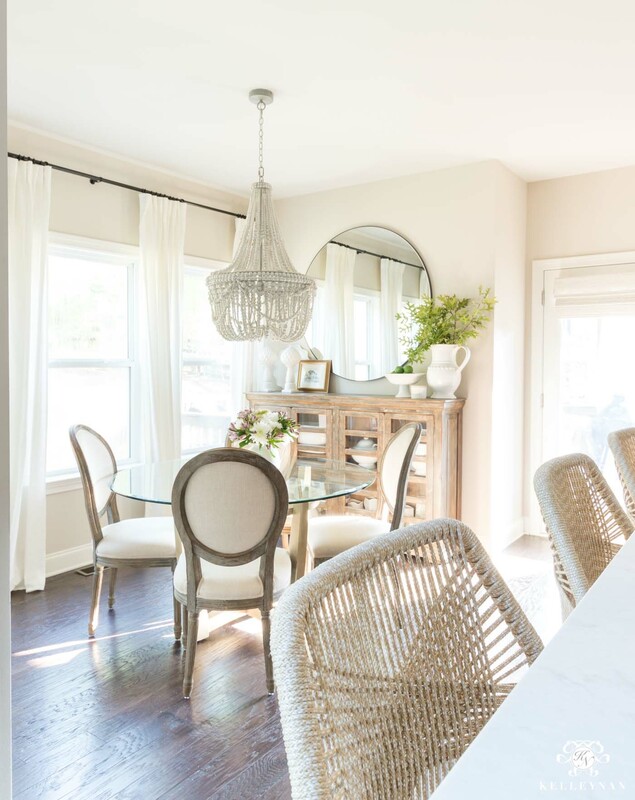 Those two round mirrors in the living room will soon be replaced with this large rattan mirror I ordered (set to arrive in December) to carry the bar-stool vibe over a little bit. Because this has been an evolving space, y’all have seen most of the updates but the large, oversized round mirror was a new addition. I actually had a round mirror in its place, in a brass finish, that was significantly smaller. After getting this 48 incher, the former looks like a dinner plate haha. 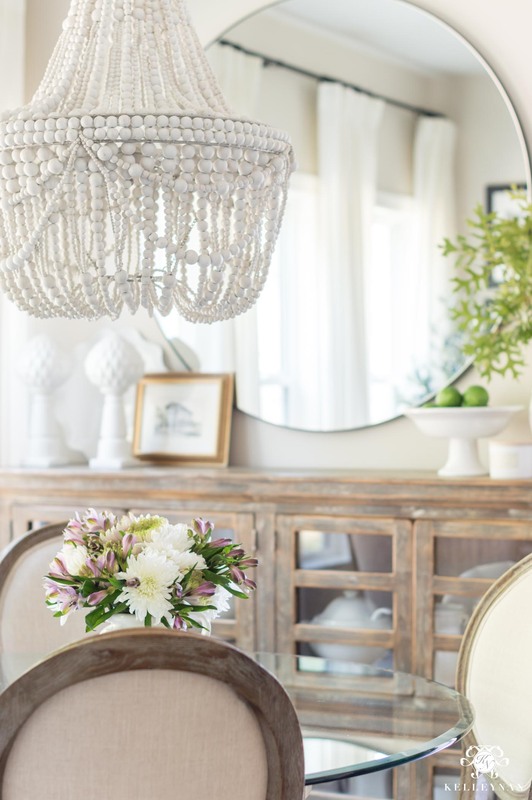 If you go back to the very first photo I shared in today’s post, this mirror did everything to reflect light, fill the wall space, and give this entire area a fresh look. Fewer, larger pieces > several smaller pieces. I also finally added a third row to my black and white travel gallery wall – you can see more on this project from the initial post HERE. Kitchen makeovers can get expensive (and totally out of hand) quickly. If you don’t have the budget to make a change, don’t. Focus on bringing in quality improvements as you can. 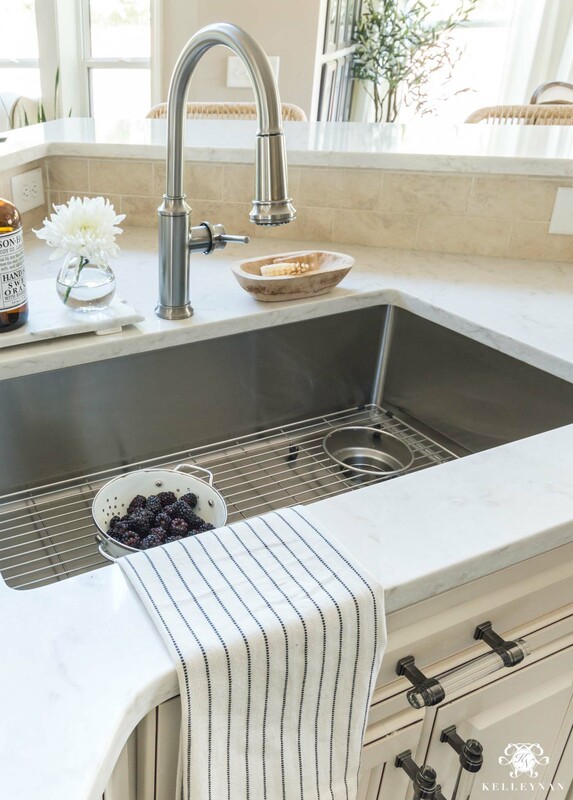 Start with the countertops; it will make a bigger difference (and add value) than you think. Replace your sink at the same time. Painting the walls is one of the most affordable updates you can make. Accessories can be collected over time. 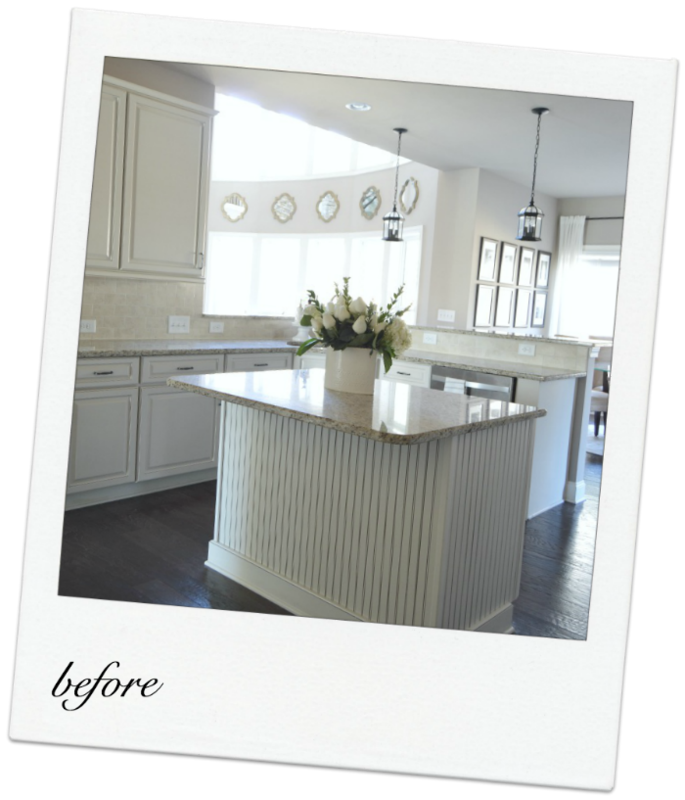 Pulls will make you re-love your cabinets and can be switched at any step of the process. Same goes for lighting. I bet you’ll even uncover some areas and pieces along the way that you’ll have a whole new appreciation for, once their surroundings start transforming. 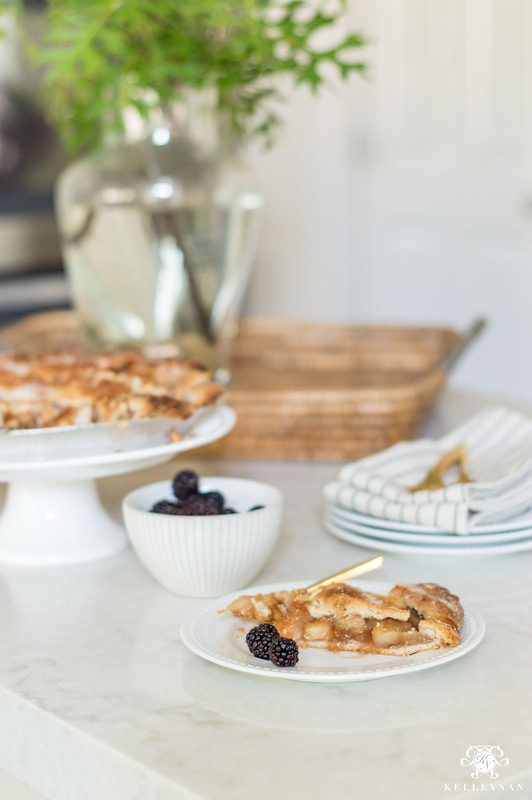 Thank you all for hangin’ in there with me as I worked my way through our kitchen project; it’s still the same space – just a better, more updated version of itself. Oh Kelley, it looks amazing!! What a difference!! I love everything but especially the new counters. 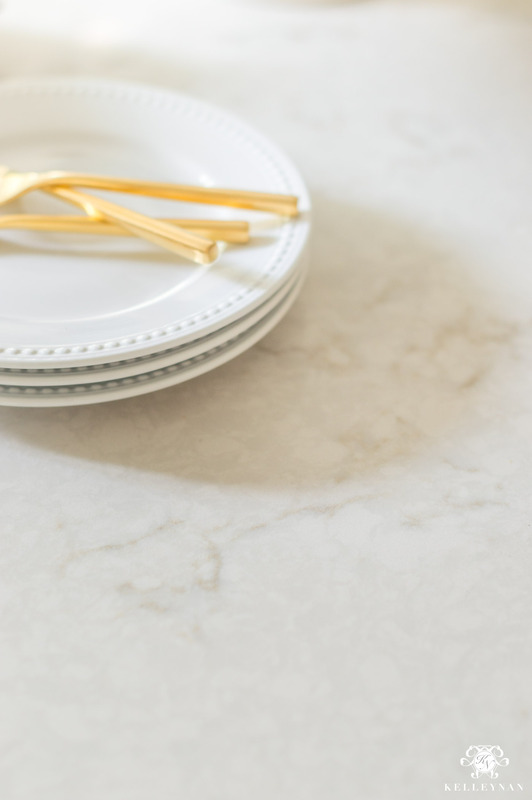 I’m living with laminate counters right now so anything marble-like is only a dream for me. 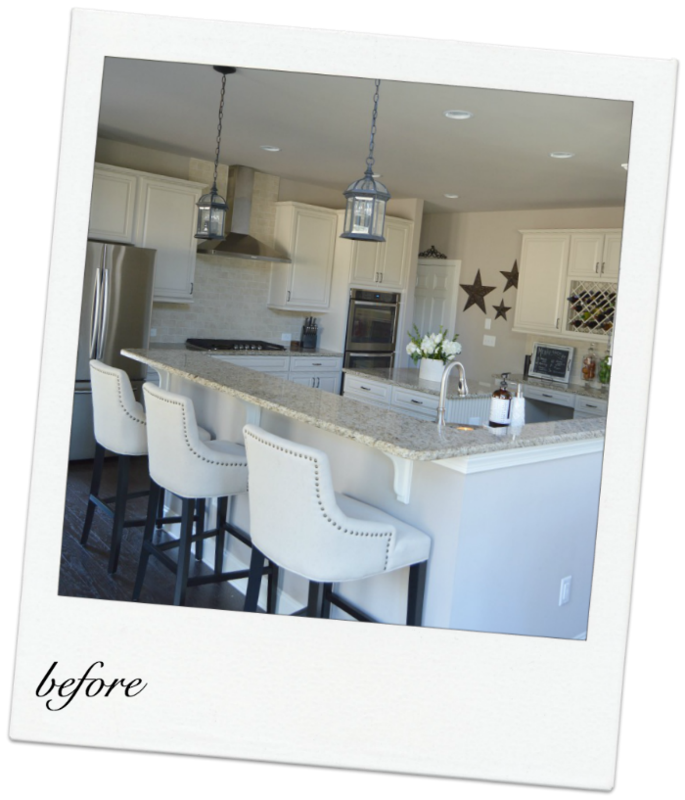 I love everything you chose for this kitchen makeover and your photos look amazing!! Kelley!!! It’s absolutely stunning! I can’t believe how different the spaces look with the changes you made. So, SO, good!!!! 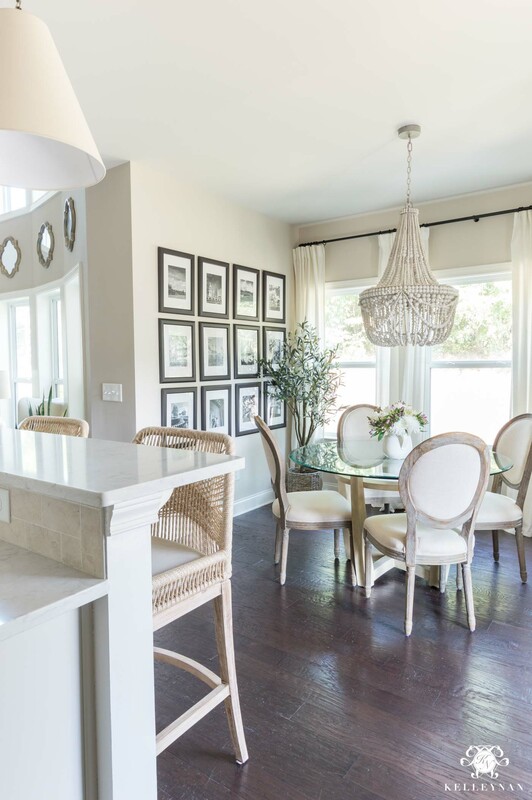 The cone pendants and barstools are my favorite. Or the counters. Or the hardware. I can’t pick!! Yay! I’ve been waiting. It’s looks so beautiful, now I’m going to get my coffee and take my time enjoying it. Sharon, thank you, thank you! WOW! Amazing Kelley Nan! I love everything especially the cabinet jewelry! Your accessories, pictures and arrangements are awesome, way to go! And as always, your photos are amazing! Tam, THANK YOU!! I am so excited for you and all your upcoming updates! This isn’t one of those posts where I had to keep scrolling back and forth to see what had changed and why it made such a difference. I’m so impressed that you pulled this together, because i couldn’t possibly have done that. Love it. And now I’mGoing back and reading all your posts, so if your hit count goes way up today, it’s mostly me,lol. Kelleyyyyyy! I seriously started having to take notes in my head of everything I wanted to comment on because there was TOO MUCH!!! Love the scale of the new pendants! Much better fit! Love the new counter stools! 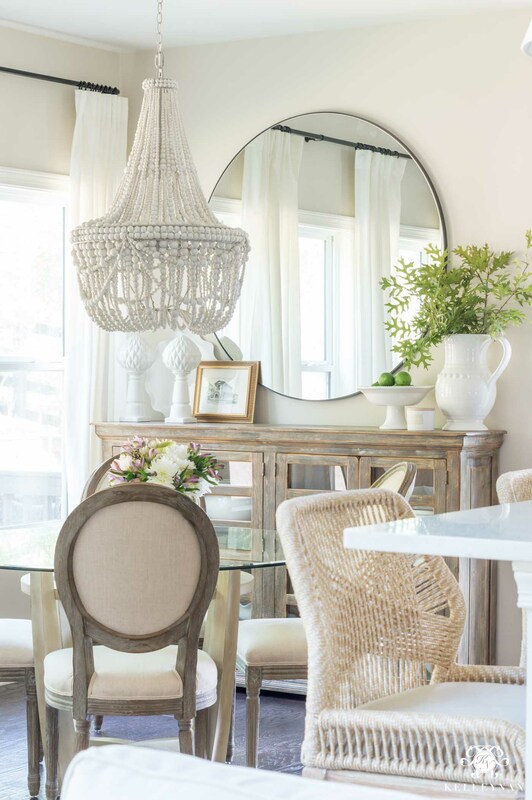 Love the simplicity of the new round mirror! Love the hardware! Love the bright counters! Love the trim work! And I will 100% be getting that paper towel holder! Lol! #obsessed Love you and your talents! Haneen, you are awesome!! How are you liking that new PT holder?! Oh my goodness—your genius design skills have wowed me again! Love the makeover, so classic and beautiful. 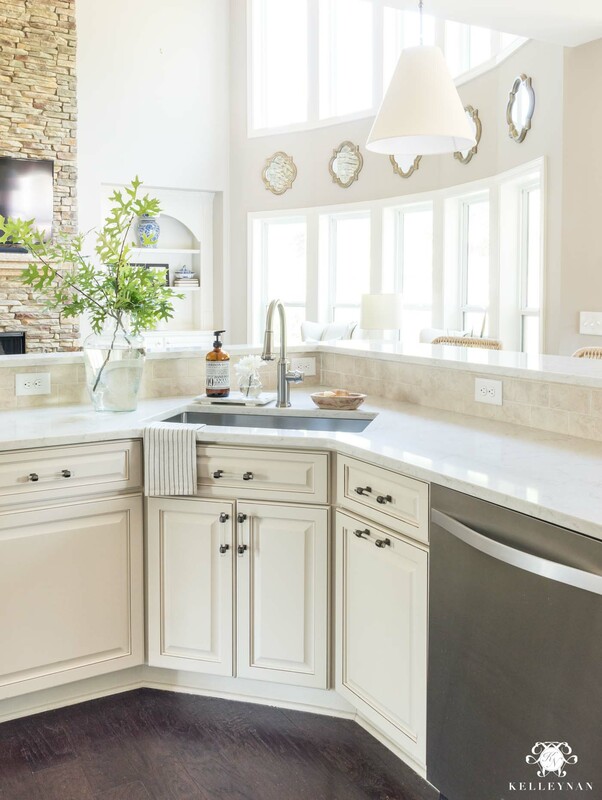 I’m interested in learning where you got the marble tray that your dish soap and little flower vase sits on (left of the sink) and the bowl and dish scrubber (right of the sink). Nicole, thank you so much! And I am so glad we went through with the trim work! This is beautiful! The before is very similar to my current kitchen situation. Hoping to go with a similar lighter quartz like yours in the near future! OHHH, Kelley!! 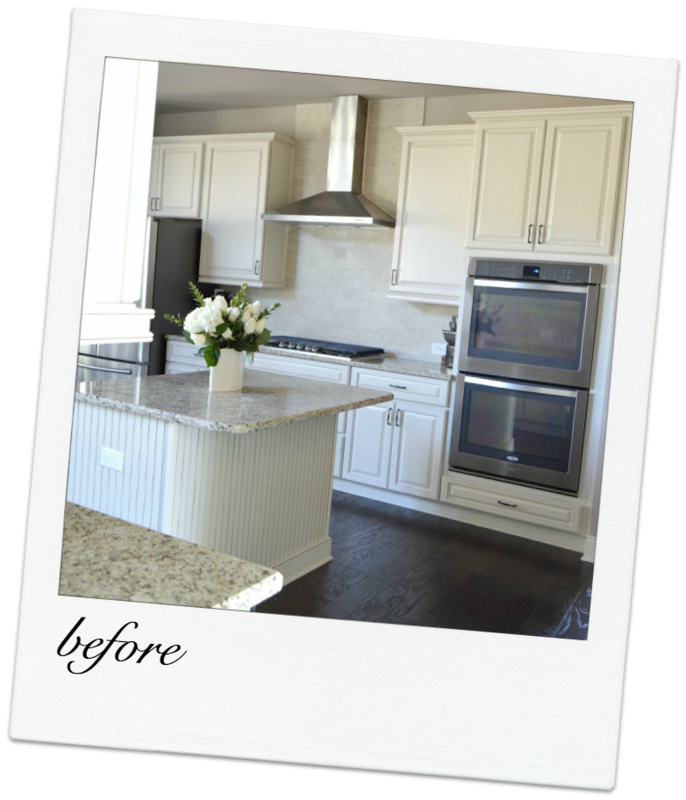 I have enjoyed following your kitchen makeover and was so excited this morning to see the reveal. Everything is just lovely and looks so comfortable. I loved the glass lights over the bar but the new ones are pretty too. You are absolutely the bomb!! Girl, I just want to know which Goodwill you take your donations to so I can go shop there! Thanks for sharing your talent and beautiful home. Haha Cecilia! You are awesome. THANK YOU, THANK YOU! Allie, thank you for taking the time to visit and for leaving such sweet words. You are so appreciated! Marley, how exciting! Be sure to take befores and afters so you can scroll back and forth and see what a change they make! Your kitchen looks great! I have a question..do you know who your cabinets are by? They look exactly like mine (minus the trim color)..I haven’t been able to find much on my cabinets and I want to fix something on mine! Thanks! Love this so much. Thanks for sharing. Our dark builders cabinets have dark busy granite. 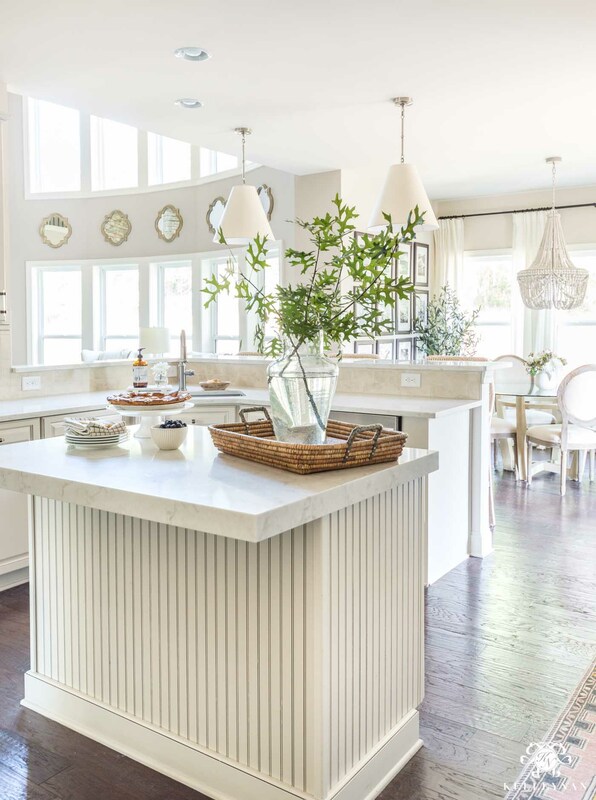 Replacing the countertops is a huge inspiration. Thanks for sharing your beautiful home and your wonderful talent. Cindy, having them crack was a blessing in disguise; I wouldn’t have guessed that in our case, they could lighten everything so much – more than even having painted our cabinets! Oh, Pamela, I am so flattered by your kindness- thank you!! Kelly, I’m going to be very honest here and tell you that when I first looked at the before and after shots, I was sort of confused. Like huh? What’s the big deal? Well, my dear, as I scrolled through this post and paid attention to your comments, my eyes were opened! The importance of what looked like mere details (hardware, for example) became obvious. 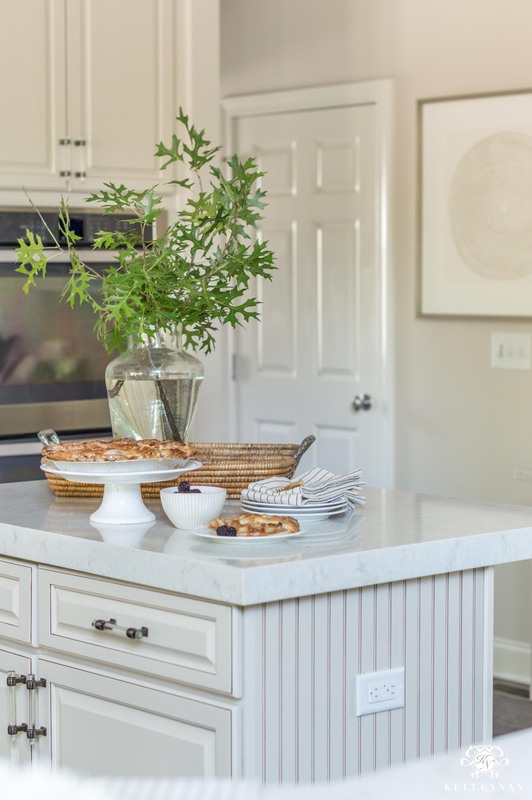 The importance of the marbling and nuance in the “white” countertop color became obvious. The significance of careful and purposeful planning became obvious. This is one very well thought-out kitchen and the results are a gorgeous compilation of that. Congratulations on an incredible transformation. May you enjoy it for many years! And thank you for the invaluable lesson of the importance of paying attention to details! Giiiiiiiiiiiirrrrl! You NAILED it! The 3″ mitered edge is always a winner! Such great selections ALL. The. Way. Through! Way to go, Kell! Marissa, that edge rocked my world haha. THANK YOU SO MUCH!! 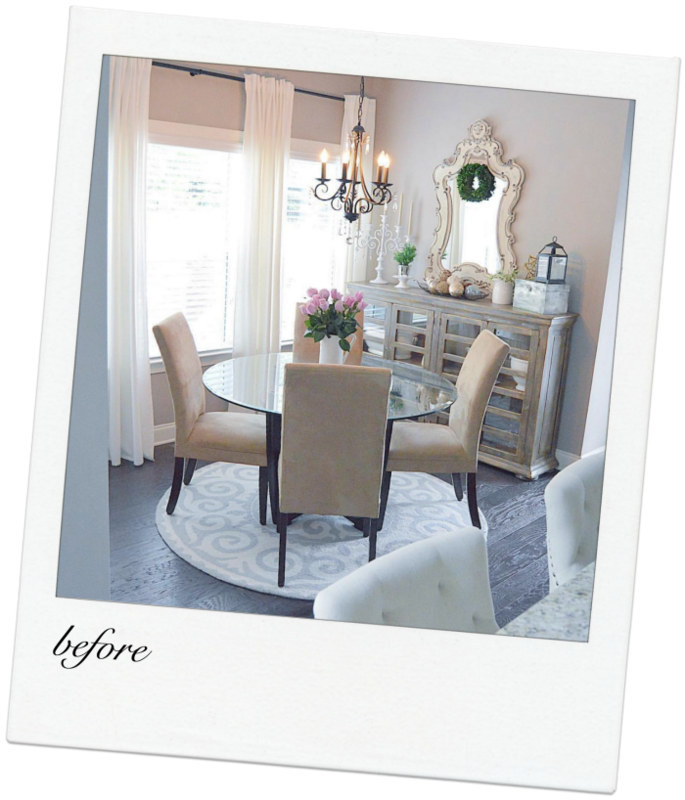 It is always amazing how a few well thought out changes can totally update and refresh a space! Great job! Kathleen, I so appreciate you stopping by! THANK YOU! You made stunning choices, and everything looks gorgeous. You must just be in heaven! It’s all so very lovely! 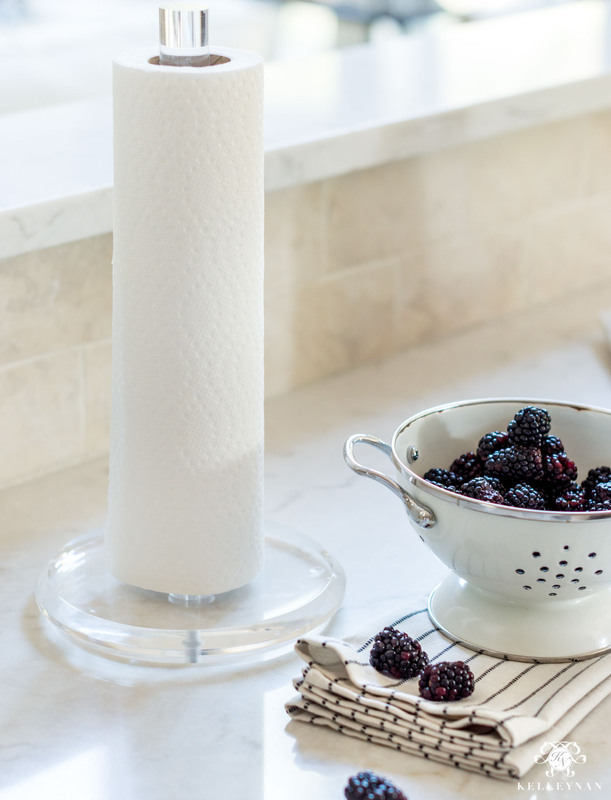 Where are your white dishes with raised dots on the edge from ? Love them ! Bravo Kel!!!! It looks amazing!!! I love your trim work and those counters tools are amazing!!! Wishing I could pop over and see it in person!!!! Oh my gosh, your kitchen is beautiful. You did a great job. If you talk with your vendor on the quartz countertops, please ask them where I might locate them in Dallas. I have creme cabinets but lots of light. I have been looking for quartz but have not found anything near as pretty as yours. I truly enjoy watching your blog. Barbara, oh my goodness, thank you!! I believe they have a locator on their site but you can also contact fabricators in your area and ask if they carry LG Viatera. They are wonderful! Wow! I’ve been looking forward to seeing how this turned out. It’s impossible for me to pick 1 favorite detail because everything works so beautifully together. It is so much brighter & sleeker looking! Well done once again! Jennifer, thank you so much! I am so pleased with the result and thrilled that the areas I focused on translated. Wishing you a wonderful week! Kelley!! Your kitchen looks incredible. Love the countertops and everything looks SO amazing.. I’m so happy for you. Good job my friend! Kristy, THANK YOU SO MUCH! Wish we could have you and Jeff over for wine, cheese, and dinner! Love the update and how well it integrates old and new. The sight lines into the other areas look beautiful. We gutted our kitchen last year and I know how painful it can be to make the right choices. Well done! Noel, congratulations on your new kitchen! This was mild compared to what I’m sure you went through. Thank you so much for stopping by and sharing your kind words. 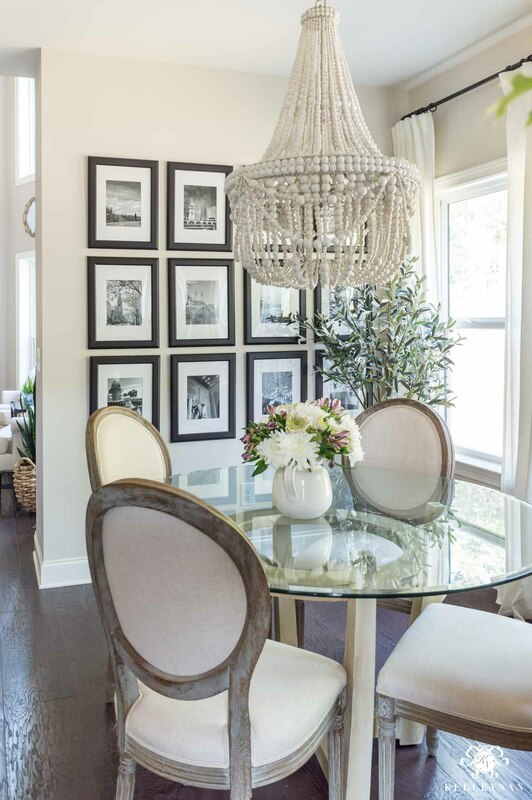 Does your Francesca Chandelier provide enough light? Hi, Erin! We have soft incandescent chandelier bulbs as we don’t need much light in that space, but if you used a (still soft) LED, it would amp it up a bunch! Haha Jen! I just saw some other stools that don’t fit here and I have no reason to have but want someone else to have them so badly!! I can’t wait to see your project! Love, love, love, all heart eyes over here. It is gorgeous. We are looking at making some changes to our existing kitchen, and like you I cannot justify redoing all of our cabinets and backsplash (they were custom years ago, but have held up beautifully). I am thinking making just a few changes similar to yours is all that is needed. After spending another week in my former MIL’s teeny tiny kitchen with no dishwasher, 20 year old microwave and dated appliances and knowing she cooked up a storm and was happy makes me rethink going all out when it’s not really necessary. And, thanks for linking all your great accessories. Two were just what I was looking for. I never thought it would be possible to update a kitchen without changing the cupboards fronts, at the very least. You managed to marry the old with the new marvellously. The new larger pendants make a statement where the little ones were lost. I’ve been waiting ALL day to sit down and read and pour over ever little detail of your kitchen. Kel, it’s amazing!!! 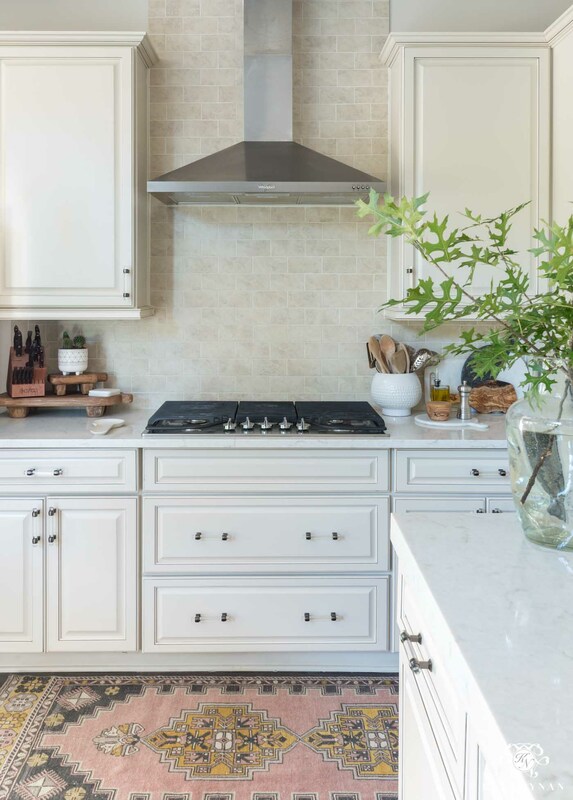 Anyone can create a pretty new kitchen from scratch but it take serious design skills to take what you already have, decide what goes and what stays (on a budget) and then bring in all of the pieces that will make it one gorgeous, cohesive space – you totally nailed it! 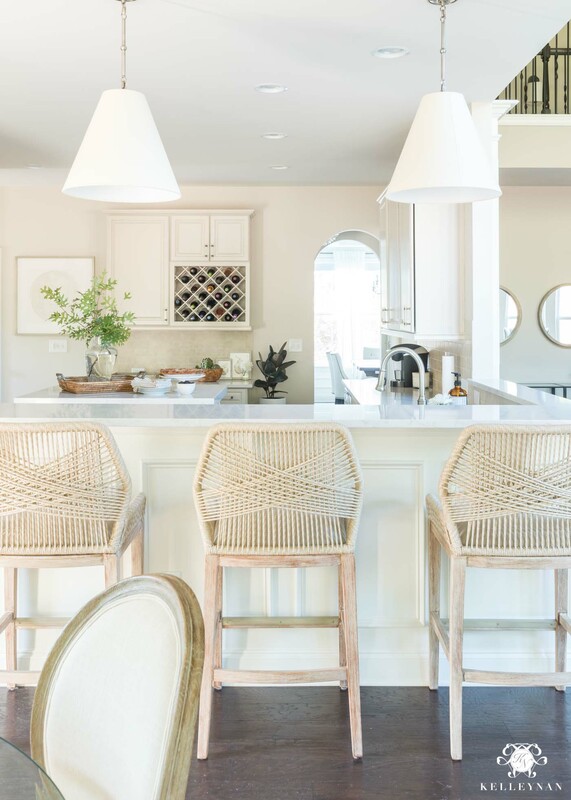 LOVE your barstools and lighting and love those countertops – so so perfect. I can’t wait to see it in person!!!! Oh…my…goodness! You know how much I loved your “old” kitchen. I must say I was a bit sceptical when your original vision was formed. Why fix what is already, so good? Turn to now, and I can’t believe the transformation you have created. Love the textures and the light. Most of all, I love how the new look is so “you”. So very well done. Bravo, Honey! Haha Nan! Thank you so much; I can’t wait for us to cook, bake, and enjoy doing all the things in it next month! Kelley! I love every single piece of your new kitchen! It’s so bright and fresh. Absolutly beautiful! You are so talented. Can’t wait to see your next project! Bree, thank you, thank you! I am beside myself to see some planning peeks of your new home! Kelley! Gorgeous kitchen! Love every detail! 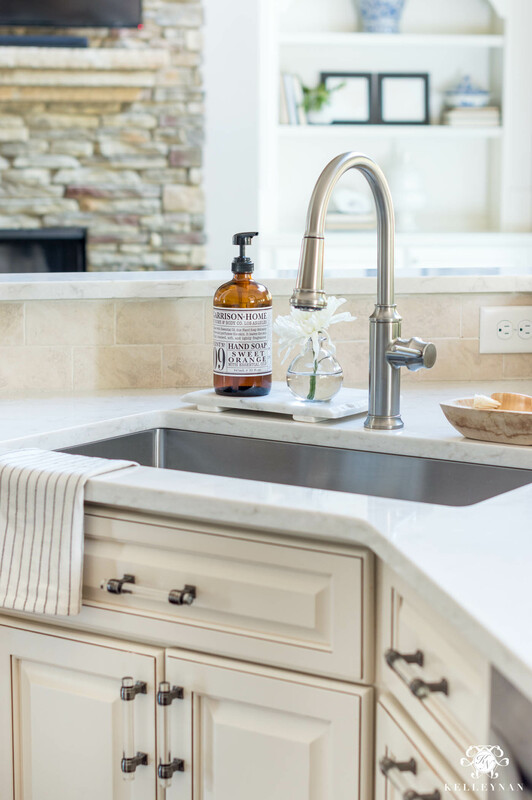 Wondering if you had considered the farmhouse sink by Blanco as well? Would love your thoughts on that style of sink. We’re about to order and I’m back and forth. Hi, Kristie! Because of the position of our sink, an apron front sink wasn’t an option but I do know others who use them and they are gorgeous! I love what you did here. This is such a great post. You didn’t throw the “baby out with the bathwater” but still created a very fresh updated look. I hope you plaster this all over Pinterest. It deserves to be seen and seen again. Well Done!! OMG I loved this post! 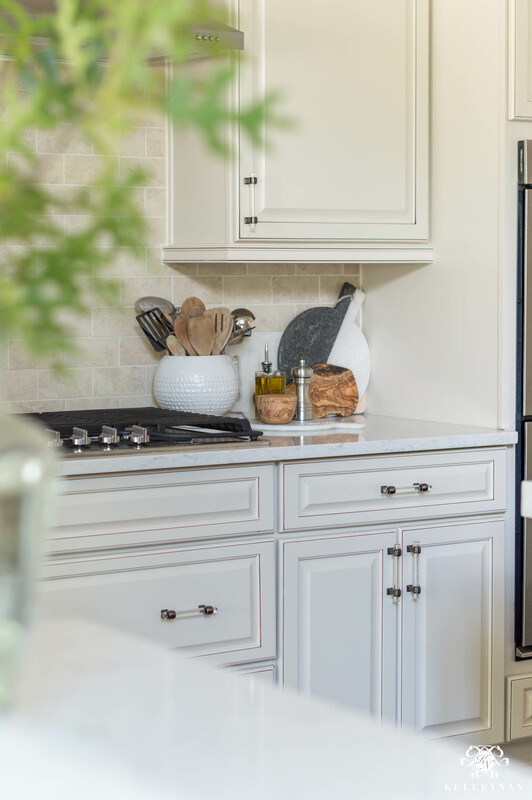 We have these exact same cabinets and backsplash and I have been struggling with how to get away from all the brown and move towards more grays. I am loving Sherwin Williams agreeable gray on the first floor of our house but we used SW Amazing Gray in the kitchen and I just don’t think it sits well against the cream cabinets. I am looking to change our countertops so this post is a huge help for me in deciding what color to do! Can you please come help me with the rest of my house?! Haha I love your taste! Melissa, that is awesome! I totally feel your struggle- I love how the Edgecomb Gray turned out against it; best of luck in your kitchen journey! 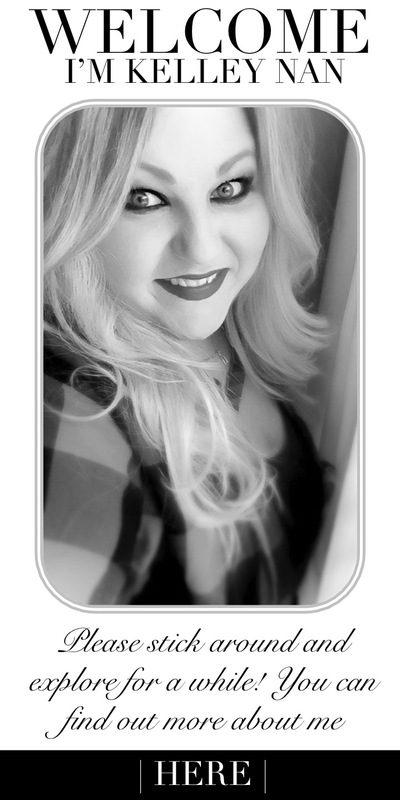 Kelley, I’m new to your blog and love your designs and posts! A while back you posted a partial update on your butlers pantry light. You were exchanging it but didn’t have the capos light. Did I miss the post with that update? 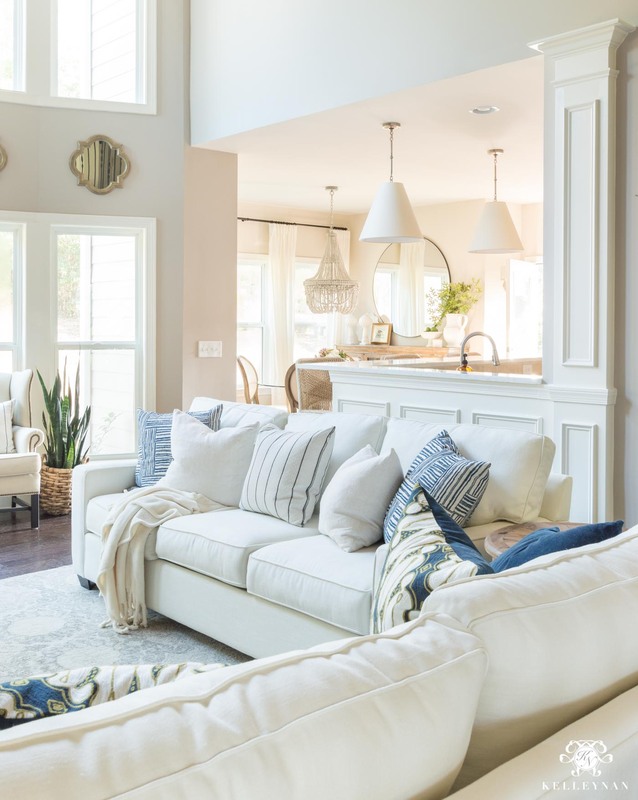 I’ve been looking into using capiz lighting as well and have a question for you… my living room fixture metals are a combo of oil rubbed bronze and antique brass. Would the capiz clash with this because of the nickel outline of the petals? Or does it have an antique brass/warm coloring? Any help would be much appreciated!! The changes you made and the explanations of why you made them are just EXCELLENT. Thanks for sharing. Can you give the brand and/or model of the faucet?